The Campbelltown District Family History Society is located in Campbelltown, New South Wales, Australia and was founded on 1st August 1989 following several meetings of those interested in researching their family’s history. Our Founding President was Kevin Wall. The Society continues to promote research into Family History by providing a range of resources for the use of all in the Local Studies and Family History section of the H. J. Daley Library, Hurley St, Campbelltown, NSW. On the first Saturday each month, except in January, we meet at 1.30pm in the Library’s Meeting Room #1, where a wide variety of guest speakers have informed, entertained and stimulated both members and visitors alike throughout the years. Each year we hold our Annual BBQ to coincide with the Christmas (December) meeting and is held at Cataract Dam, located approximately 30km south of Campbelltown. Come along and join us at our meetings. Visitors are always welcome. Check the Events page for updates on our Guest Speakers and their topics. 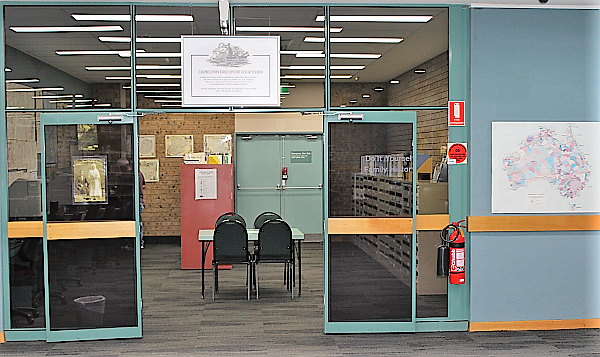 The Family History Research Room is located within the Campbelltown City Library and holds an extensive collection of books, microfilms and other resources to assist researchers. A list of the resources available can be found on the Family History Room Resources page. The Family History Room is open 7 days a week during normal library hours. Library staff will assist. Check out our ONLINE SHOP to see what resources are currently available. A variety of payment options are available including PayPal, cheque, money order, or EFT. Contact the Treasurer for more infomation. During 2019 the Campbelltown District Family History Society will be conducting the following courses. © 2018-19 Campbelltown District Family History Society, Inc.